Tomoaki Ayano is "disappointed" that hackers gained access to Street Fighter X Tekken's DLC characters, but he acknowledges their skill. So, in case you haven't heard the cries of incomprehensible rage, Street Fighter X Tekken features 12 "DLC" characters, all of which are on the disk. Shortly after the game launched, unscrupulous hacker-types realized they could, via unsavory hacker-magic, unlock the extra characters. Instructions were posted shortly thereafter, meaning anyone running modified PS3 firmware could stumble around online playing as characters legitimate players couldn't access. Hilarity ensued. "Personally, I was really surprised when I heard the news that the characters had been hacked, basically," producer, Tomoaki Ayano, told GameSpot. "So I was pretty disappointed by that. I was really surprised at how skillful the hackers were, basically. But I was really kind of disappointed that it created this kind of environment where a bunch of players were playing the characters but a bunch were unable to play with them." I too am disappointed that a group of people created an environment in which some players have access to certain characters while other, less fortunate, players do not. Do you see how neutral that sentence is? It's very neutral. Like Witcher neutral. That's me. Neutral. 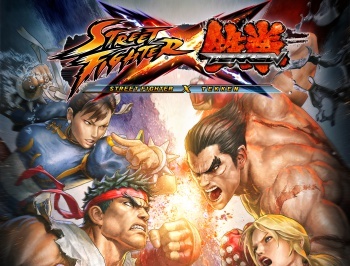 The DLC, which contains 12 characters, equally split between the Street Fighter and Tekken franchises, isn't available yet,but it's slated to cost $20 (1600 MSP). The Vita version of the game, which I won't be picking up because the idea of playing a fighting game with a Sony d-pad makes my left thumb retreat into my forearm in fear, comes with all the DLC characters and a few exclusive ones to boot.